What Are the Best Items for an Outdoor Kitchen? As the weather cools down, the snow is going to start falling. There are some diehard fanatics that fire up the grill even in the winter, but for most of us this is usually not a time to go outside and cook a meal or enjoy the views. It however, can be a great time for you to plan for your next backyard cookout season with the right tools. 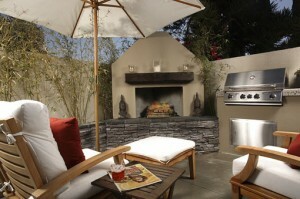 But what items should you include in your outdoor kitchen to make it the best? Outdoor kitchens are more than just that BBQ and picnic table set out back like they once were. Now you’re able to have a fully functional kitchen, right in the back of your home. Be able to open the fridge up for cool drinks, cook your food on the grill with the corn on the burners. Countertops and additional features, just like your kitchen inside the home, welcome you when you’d like to have a great meal outside. Hybrid grilling drawers that allow you to use propane, wood or charcoal as needed. Mini fridge for holding all of your cool drinks. Small sink that is big enough to wash or even just rinse the dishes that you use, and for your hands! Side burners so you can cook up that pasta or side dish while the main course is on the grill. Utility drawers so you’re able to keep all of the extras that you need while cooking or eating within arms length -stop running back and forth between your house when you’ve got everything you need right there. For the ultimate, mini dishwashers are also made for the outdoors area so you can wash everything up and put it away – no going back indoors for cleanup. Don’t let the cold weather hold you back – now is a great time to start the planning the outdoor kitchen of your dreams. Contact us today – we are your MN landscape design and installation crew that can help you with everything from planning your outdoor kitchen space to putting it in for you. Make sure to check out our Pinterest board to find out some of the best ways to make your outdoor kitchen stand out! For a free initial design consultation, call us at 952.292.7717.